our Musical director Jennifer Westcott presented a cheque for £300 to Head Teacher Rachel Bisset. Jennifer presenting a cheque for £300 to Keinton Mandeville Primary School's Head Teacher Ceri Austin during an assembly on 7th December. On both occasions a group of Brue Boys led the children in singing a round 'I'm Going to Sing' with three spirituals including 'When the Saints' and 'Swing Low, Sweet Chariot'. 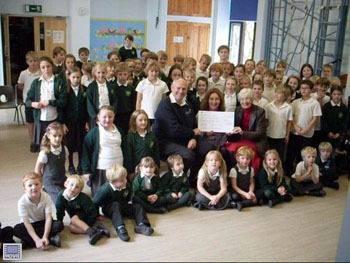 Butleigh Primary School will buy in a singing scheme from Somerset County Council. The Brue Boys is a UK Registered Charity and aims to make grants to promote music education through grants to local primary schools on an annual basis. This brings up to £3600 the total that the choir has given in grants to schools. The choir's concluded their 2015 programme with concerts on successive Saturdays in Butleigh and Babcary which raised over £1600 for local Churches - see the 2015 Concerts page for photos and reports. See report on the 2015 Concerts page. After rehearsing three songs in our existing repertoire, we decided to start learning a four-part version of the famous 'Summertime' from Gershwin's Porgy and Bess to add to our song list. Secretary David Marshall highlighted the possible nine concerts which were either confirmed or being planned for the next year - see Future Concerts page. Treasurer Roger White confirmed that our concerts had enabled concert organisers to raise £4143 for charity in the last year and a grand total of over £21,000 since the choir was formed in 2007. In turn the Brue Boys have donated £3000 to local primary schools to promote music education over the years. It was agreed that annual subs (payable in September) will now be £60. 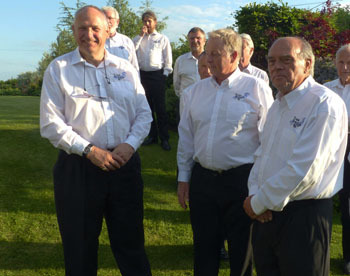 Musical Director Jennifer Martin reviewed what she called a stunning' year for the choir, culminating in the Entente Chorale event when we hosted Les Voix du Marais Choir in July - see Entente Chorale 2015 - during which a record 41 Brue Boys performed in Keinton Mandeville Village Hall. She thanked all the choir and the officers for their support and especially the work of accompanists Carolyn Young and Hilde Senior. Existing officers were elected to serve for another year - see Officers page. In our final session before our summer break we will welcomed Chris Samuel to Tilham to lead a workshop on Monday 20th July. Chris leads choirs who sing in a distinctive unaccompanied style, including The Spooky Men's Chorale and his two hour session was very enjoyable. He taught us to song a the Beatles song 'I Love Her' in three parts and a distinctive chant based on the melody and rhythm of the Rolling Stones' Satisfaction. After the workshop we rounded another successful year with appropriate refreshments at The Stalls. The Brue Boys performed in Charlton Mackrell Church for the second time on Saturday 20th June. See the 2015 Concerts Page for a report and photos. Above - The Tenors; Left - The Baritones; Below - The Basses. The Brue Boys made another appearance at the Royal bath and West Show on Saturday 30th May 2015, singing two sets of songs on the Village Green Stage. Amongst the audience was a celebrity actor and writer who is also a peer of the realm - see the 2015 Concerts Page for a report and photos. I finally managed to meet up with Carolyn to give her a cheque raised by the choir to go towards something of Carolyn's choice to thank her for seven years of being the Brue Boys' pianist. She was a founding member and without her support and commitment Jennifer would have struggled to get the choir off the ground and maintain its forward momentum. We must recognise that being an accompanist is a major commitment. From time to time individual members absent themselves from concerts for various reasons and "the show still goes on", but without the accompanist there can be no concert! The photo left shows Carolyn playing a splendid digital piano that our gift helped buy, with which she is thrilled. This enables her to develop her jazz playing and attendance at various gigs. In the background to the pictures is the gypsy caravan which Mike and Carolyn have lovingly restored. The dark red paint was purchased with the Christmas voucher given by the choir to Carolyn. 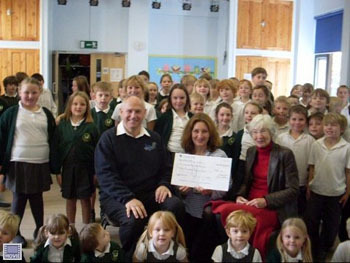 The photo right shows Robert presenting the cheque. See below for a report on Carolyn's last performance. The Brue Boys performed in All Saints Church Castle Cary on Friday 8th May - see the 2015 Concerts Page for a report. The 2015 dinner was held at Long Sutton Golf Club on Saturday 28th February. See photos and a report of this successful event on our 2015 Dinner page. We were sad to learn that Carolyn Young, who has been the main pianist accompanying the choir since it was founded in 2007, has decided to retire from this role. 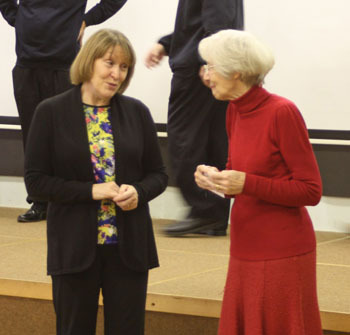 Carolyn's fine playing has been the backbone of Brue Boy concerts for over eight years, and will be sadly missed. Carolyn nevertheless played with the MJB6 during the 2015 dinner at Long Sutton Golf Club and also accompanied a table competition at the dinner when each of the 9 tables sang a new version of the Brue Boys' Song. This gave us an opportunity to thank Carolyn and Chairman Robert Peto did this on the choir's behalf and presented Carolyn with a gift to mark the occasion. We hope that Carolyn will make guest appearances at dinners and perhaps in concerts, possibly by again playing the harp which she has done with great skill before. Nevertheless, we are delighted that Hilde Senior, who has been a regular accompanist for the choir when Carolyn was unavailable, will now step up to be our principal pianist alongside Musical Director Jennifer Westcott. The Brue Boys performed their first 2015 concert to a packed audience at West Lydford Church on Valentine's Day 2015 - for a report see 2015 Concerts page. Our 2014 concerts enabled the organisations who hosted them to raise £5151 for charity and we paid out a further £600 to charitable causes (see presentations to local primary schools below), making a grand total of £5715. Altogether the Brue Boys have enabled organisations to raise a total of £19118 for charity and we have distributed a further £3005 to support music education in local primary schools, making a grand total of £22123 since the choir started in 2007.
to present £300 cheques to help their music education. 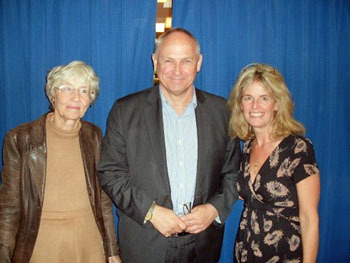 Jennifer and Robert with Baltonsborough Primary School Head Teacher Michelle Heap on 17th October. 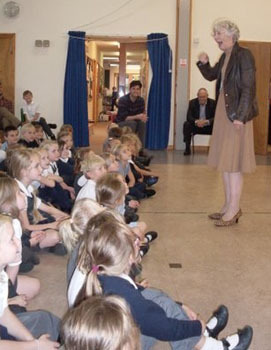 Right: Jennifer leading the children in the song 'Grand Old Duke of York' during the assembly at which the cheque was presented. The school plans to use the £300 to organise a gospel singing workshop with a member of the choir ' Black Voices' who have performed to the British Royal Family, the last Pope and Nelson Mandela. Robert and Jennifer with staff and pupils from Ditcheat Primary School on 20th October. The school plans to use the £300 for a term's drumming lessons for one of their classes. The choir have been shocked and saddened by the sudden death of tenor Clive Thomas on 21st September. The Brue Boys sang the stirring and appropriate Welsh hymn 'Aberystwyth' at a memorial service for Clive held in St Leonard's Church Butleigh on Tuesday 7th October at 11.30am. Clive was due to sing at Stourhead and he is greatly missed by all the choir. The AGM was held on Monday 14th July after the singing of some favourite songs. Afterwards we enjoyed refreshments and good company. On Saturday 17th May our Musical Director became Mrs Jennifer Westcott as she married tenor John Westcott in Baltonsborough Church. This was a wonderful local and family occasion and afterwards The Brue Boys sang during an interval at the Barn Dance in the splendid marquee erected on the playing field behind the School / Village Hall. See The Wedding Page for more. At a meeting of The Rotary Club of Shepton Mallet, held in Bowlish House Hotel on 1st July 2014, a cheque for £1424.71 was presented to Justin Sergeant representing the Somerset Community Foundation to benefit the Somerset Flood Relief Fund. The Brue Boys waived their usual fee for the concert, so boosting the profit. Photo shows, left to right, Brue Boy Andrew Look, Justin Sergeant, and Roger Yeoman who presented the cheque on behalf of the Rotary Club. On Monday 30th June we welcomed Alwyn Humphreys who led our fourth workshop by a leading musical director. Alwyn led a lively session which challenged us to work in different ways, firstly by re-arranging our placing with tenors centrally, reversing the basses situation and moving the baritones sideways. He also insisted on us not using our printed music for known songs and promoted this as a style for the choir. This move would be popular with many and no doubt will lead to further discussion of a policy we have firmly rejected in the past in favour of continuing to use music in our concerts. Several of our songs have been arranged by Alwyn, so we enjoyed his insight into his interpretation of these pieces as we aspire to continuous improvement. His work on diction, ensuring separate parts blended together and attention to the priority for leading parts carrying the tune will stand us in good stead as he rehearsed songs which included 'Aberystwyth', and started to teach us 'Roses of Picardy' which is the second part of a World War I medley that he arranged. 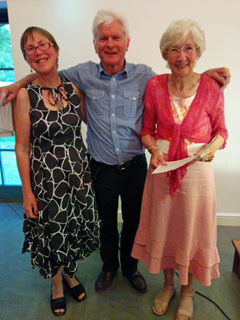 Photo left from Dave Reynolds taken after the workshop shows Alwyn Humphreys flanked by our Musical Director Jennifer Westcott (right) and accompanist Hilde Senior who is standing in for Carolyn Young during the summer months. Dr. Alwyn Humphreys MBE combines two busy careers as a television presenter and choral/orchestral conductor. He is Conductor Emeritus of the Morriston Orpheus Choir and Principal Guest Conductor of the Chamber Orchestra of Wales. 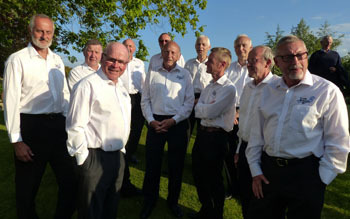 The Brue Boys choir joined the National Association of Choirs in 2013. The NAC was founded in 1920, is a registered UK charity and offers a range of services to help the Brue Boys. See the NAC website: www.nationalassociationofchoirs.org.uk for more information.